I’ve read all or parts of Bartram’s Travels hundreds of times, but whenever I re-read it I always find something new that fascinates me. William Bartram journeyed from Savannah, Georgia to Augusta during 1773, and in his book he describes the flora of the maritime forests, lower coastal plain, and upper coastal plain. The descriptions are so packed with information I didn’t notice until recently a small paragraph about some piedmont plant species he first encountered alongside the shoals of Augusta. He refers to this spot as a cataracts. Several important Indian trails converged here because the shoals afforded a shallow crossing. Augusta developed as an Indian trading village because of these shoals. Bartram describes Augusta as a small village that reaches all the way to the “cataracts,” and it was surrounded by “gay lawns and green meadows.” Augusta is on the edge of the hill country, and species that prefer higher elevations begin to occur here. Bartram arrived in May when all of these species were in full bloom. He listed Rhododendron ferruginum, Philadelphus inodorus, Malva, and Pancratium fluitans. I haven’t visited the shoals in a while, but I don’t recall seeing any of these species next to the shoals. They’ve been eliminated from the immediate vicinity, though the first 3 are commonly planted as ornamentals in people’s yards. Bartram wrote Pancratium fluitans inhabited every rocky islet on the shoals. 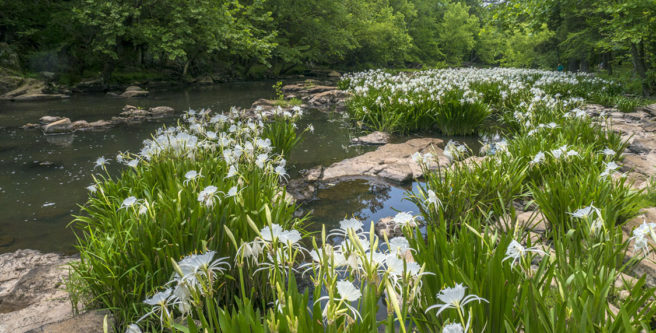 (The common name of this species is rocky shoals spider lily. It’s modern scientific name has been changed to Hymenocallis coronaria.) Unfortunately, today there are just 50 populations of this species left because reservoirs inundate their favored habitat. The natural beauty of rocky shoals has diminished since Bartam saw them. Augusta shoals. The lock was built 100 years after Bartram saw it. Rhododendron ferrugineum is a common ornamental plant in Augusta. It grew wild near the Augusta shoals. Scentless mockorange is also commonly planted as an ornamental but wild populations grew near the shoals. Common mallow is a non native species that was already widespread in Augusta by 1773. This is probably the Malva species Bartram mentions. There is a native species of mallow–Carolina mallow (Modiola caroliniana), however Bartram described the mallow he saw as blue, and this is the wrong color for Carolina mallow. Rocky Shoals spider lily. Only 50 populations of this species still exist. Most have been wiped out by reservoir creation. 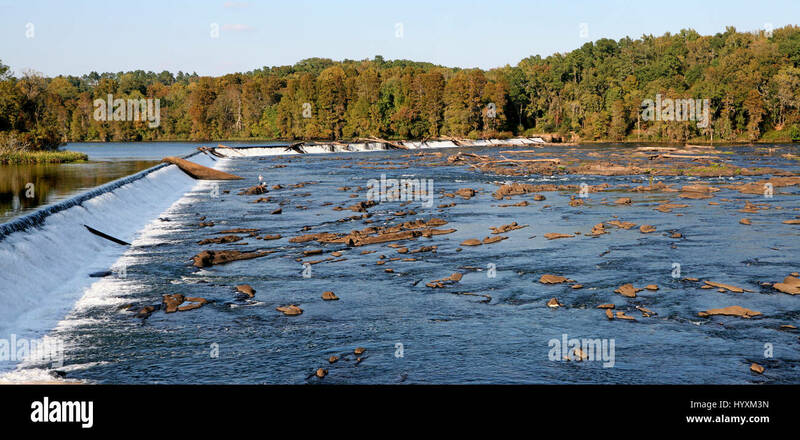 In Bartram’s day they inhabited every rocky islet on the Augusta shoals. The ancestor of the modern cultivated peach (P. persica) depended upon megafauna for dispersal and is now extinct in the wild. Asian elephants and primates such as macaques and early humans ate the fruit and distributed the seeds throughout the environment, but without these species P. persica disappeared from the wild, and now only exists in cultivated fruit orchards tended by modern humans. Peaches originated in China, and peach seeds dating to 2.5 million years BP have been found there. Scientists designated these ancient peaches as a unique species they refer to as P. kunningensis, but they admit there is no real difference between this species and P. persica. Peaches have been cultivated in China for at least 7500 years where evidence of early peach cultivation has been found in the Yangtze River Valley. Farmers began grafting varieties with larger fruit to pit ratios on to root stocks of other peach trees then. Peach cultivation spread from China to Persia (today known as Iran) and from there to Europe. Early Spanish explorers brought the fruit to southeastern North America during the 1500’s, and John Lawson found peach trees thriving in Indian villages when he explored and settled in North Carolina between 1700-1711. (See: https://markgelbart.wordpress.com/2012/07/27/john-lawsons-voyage-to-carolina-1700-1711/ ) The quality of some of the fruit was so much better than European peaches Lawson mistakenly thought some varieties originated in North America. The real reason American peaches were better than the European fruit was because the climate in southeastern North America was similar to their land of origin–China. Lawson planted peaches in his orchard, and he had 1 freestone yellow nectarine tree that produced 15-20 bushels every year, unless there was a late spring frost. (A nectarine is simply a smooth-skinned variety of peach.) He claimed peach trees planted from seed bore fruit in 2-3 years, and the fruit from the offspring was the same as from the parent. Peaches were so abundant he fed the excess fruit and corn to the hogs, resulting in sweet pork. He also made vinegar from peaches. Lawson’s account of raising a peach orchard from seeds fascinated me. Most fruit varieties are mutants grafted on to rootstocks because most wild trees produce fruit of inferior quality. I researched online and found a discrepancy. Some agreed with Lawson and claimed fruit from peach seeds produced fruit similar to their parent, but a study written by an horticulturalist from LSU found that fruit grown from seed was usually inferior. So I conducted my own experiment. I noticed peach trees often germinated in my compost pile. I took these seedlings and transplanted them in my yard. Now, 5 years later I have 4 trees that are bearing heavily. 1 tree produces freestone peaches during the last 2 weeks of June. All the peaches on this tree were infested with plum curculio larva. Plum curculio is a beetle that damages all kinds of fruit. However, I cut away the worm-infested, bird-pecked parts and tasted the fruit. (Birds get a double treat from my peaches–fruit and protein.) For an early ripening variety it is a good peach. The other 3 trees have fruit that ripens throughout July. 1 of them was partially infested with plum curculio, but the fruit is excellent. Another tree produces very large peaches that are as good as the best farmer’s market peaches. The 4th tree produces small, bitter, heart-shaped peaches that in appearance resemble the most common variety grown in Georgia and South Carolina–the red globe peach. I’ve concluded Lawson was mostly right, and the LSU study was wrong. 75% of my peach seeds produced good quality fruit. Late June peaches from a tree I planted from seed in my yard. The fruit from this tree had an 100% plum curculio infestation rate. They were still edible, if I cut away the damaged part. The quality was good for an early season peach. This tree produces large luscious peaches. None were insect-damaged but some cracked open because of rain, even though the soil in my yard is sandy and well-drained. This was the best-tasting peach I ate all season. This tree is a bit of a natural dwarf. The fruit is small and bitter. I’ve read thinning out the fruit may have improved the quality. I might try that next year. My experience with this peach tree growing experiment has taught me a few things. Spraying insecticide doesn’t work. Rain washes the insecticide off, and the insects just return. The peaches with no insect damage were growing in open sunlight with no undergrowth. I hypothesize shade and undergrowth shelters insects from predators and harsh sunlight. I can’t do anything about reducing the shade over my other 2 peach trees, but I will try harder to control the Virginia creeper. This vine is tenacious, but I think a thicker layer of mulch might suppress it. Peaches need more nitrogen than other fruits–more evidence they evolved in plots rich in megafauna manure. My fastest growing peaches just happen to be growing over the drain field to my septic tank. The Georgia extension office recommends 58 varieties of peaches, but they don’t even list 3 of my favorite varieties–Indian blood cling, Oregold, and Halehaven. Peaches stay in storage for just 2 weeks, so many varieties that have different ripening schedules have been developed to extend the season. They recommend 1 late April variety, 12 May varieties, 16 June varieties, 23 July varieties, and 6 August varieties. The mid-season free-stone peaches are the best-tasting. There are also white peaches. These are sweeter and more aromatic, and in my opinion taste like a completely different fruit. After my difficult experience however, I recommend other fruit for the casual home gardener in Augusta, Georgia. Blueberries, figs, muscadine grapes, and even apples are much easier to grow than peaches here, even though Georgia is known as the peach state. I posted the below photo on the Florida Flora and Systematics Facebook page, and the 2 plants in the picture were identified within about 5 minutes. I saw this shrub and flower growing at Manatee State Park in Florida, while I was in the sunshine state visiting my sister and mother who recently moved there. I joined that Facebook group because I am not as familiar with plants found in Florida as I am with Georgia’s flora. I’ve read about tallow plum, but it was a big help for someone to help me identify it. The flower in the foreground is Chapman’s pea (Chapmannia floridanus); the scrub bush in the background is tallow plum. Tallow plum is in the Olalaceae family which includes olive, ash, and privet. It produces an edible, waxy, sour fruit; and the tree reaches an height of 18 feet. The tough plant thrives on sandy soils and can even grow on beaches, perhaps explaining its wide geographical distribution. This species is found throughout most of Florida as well as the Caribbean, Central and South America, Africa, and Australia. I wondered how it attained such a vast geographic distribution, but when I researched the species on google, I found no scientific studies delving into this mystery, and I learned no genomic wide studies of the Olalaceae family have been conducted yet. I couldn’t even find any speculative discussions of its range, so the ancient history of this species has been overlooked. I hypothesize tropical storms disbursed this species on rafts of vegetation to different continents near the equator. Hurricanes can wash plant material far out to sea, and when it lands on a different continent, surviving flora and fauna can then colonize new territory. (Animals often cling to these rafts of vegetation.) This hypothesis has also been proposed to explain how monkeys and rodents originating from Africa colonized South America, and it is the commonly accepted explanation for how anole lizards conquered Caribbean Islands and southeastern North America. 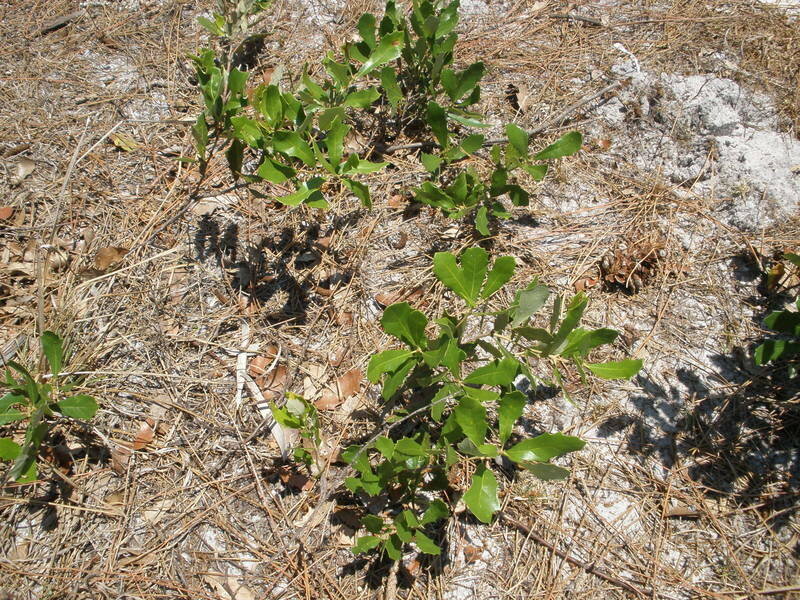 The ability of tallow plum to grow on sandy soils helped them set roots on beaches when they made landfall, following severe storms and currents that carried them halfway around the world. Uprooted plants must have been able to survive for weeks while floating on the ocean before reaching land where perhaps waves or river currents reburied the roots in soil. Some soil likely clung to the floating uprooted plants, and timely rains helped keep the plants alive. The only fossil site with specimens of tallow plant is of Pliocene-age, and it is found in Africa. The site is estimated to be between 4.3 million years BP-3.8 million years BP. The only other species of tallow plum (X. caffra) is also found in Africa. It seems likely Africa is the continent of origin for tallow plums. Geneticists could shed light on the evolutionary history and distribution of tallow plum, if they ever look at its genome. Dinosaurs probably ate pawpaws. The large size of the fruit likely evolved to attract hungry dinosaurs that then deposited the still viable seeds in piles of dung. Scientists identified fossil pawpaw leaves from both late Cretaceous and Eocene age strata. Though many Cretaceous plant genera didn’t survive the K-T impact that rubbed out the dinosaurs, pawpaws along with fig, sycamore, and laurel did. Pawpaws profusely produce sucker roots, and this habit likely allowed them to regrow after the cometary impact incinerated above-ground vegetation. The species of pawpaw that grew during the Eocene was Asimina eocenica. Fossil leaves, or rather impressions, of this species have been found in Texas, Colorado, and Wyoming. Pawpaws no longer range into the latter 2 states, but, of course, climate was much warmer during the Eocene. There are 7 species of pawpaws. 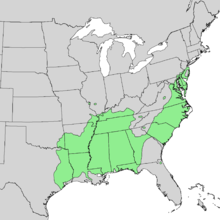 The most common is the eastern pawpaw (A. triloba) which ranges throughout most of Eastern and Midwestern North America and is found in 26 states. All other species of pawpaws occur either in south Georgia, Alabama, and Florida or are found exclusively in Florida. The list of other pawpaw species includes slimleaf pawpaw (A. longifolia), big flower pawpaw (A. obovata), small flower pawpaw (A. parviflora), dwarf pawpaw (A. pygmea), netted pawpaw (A. reticulata), and 4 petal pawpaw (A. tetramera). The great number of species found in Florida might suggest this may have been a center of evolutionary origin, but pawpaws first evolved before Florida even existed. 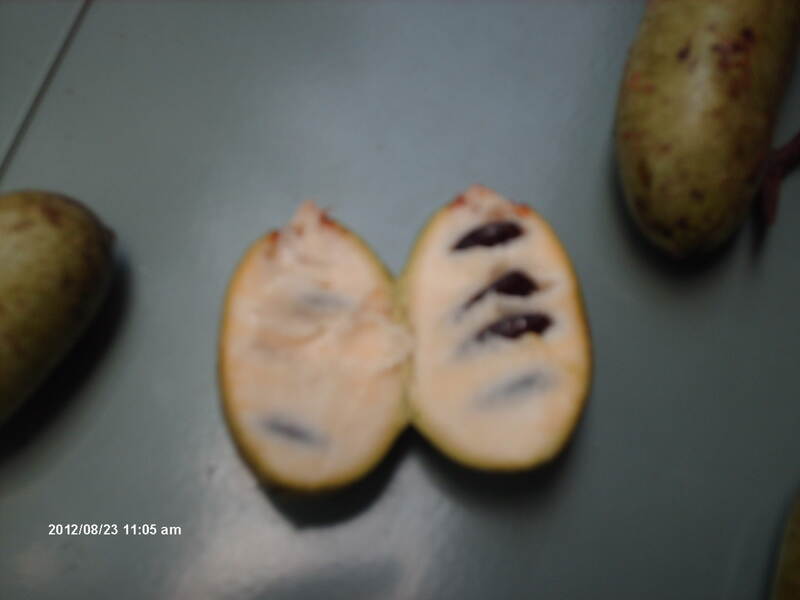 Instead, pawpaws likely speciated in this region when high interglacial sea levels isolated various populations. Pawpaws are the only genera within the Annonacea family that can survive in temperate climates. All other species within this family such as custard apple, cherimoya, and sweetsop are restricted to tropical regions. The larva of the zebra swallowtail butterfly (Protographium marcellus) feeds exclusively on pawpaw leaves, and it also is a rare temperate member of a mostly tropical subfamily. There are 150 species of Graphinii butterlies, and the zebra swallowtail is 1 of only 2 species that occur in temperate climates. There were probably more species in the Annonacea family and Graphinni subfamily that occurred in North America during the Miocene when climate was more tropical to subtroptical, but pawpaw and zebra swallowtails were the only ones that evolved the ability to survive frosts. Scientists believe the present day patchy distribution of pawpaws indicates it depended upon now extinct megafauna for dispersal. Beasts such as mastodons and ground sloths ate the large fruit and deposited the seeds throughout the environment. Today, pawpaws mostly grow as an understory tree in shady bottomland forests, but they produce more fruit in sunny locations. It seems probable that in the past mastodons would carry the fruit away from the shade in their alimentary tracts and defecate the seeds in a sunnier spot. In a recent experiment horses and Asian elephants refused to eat pawpaws. However, mastodons were not the same species as the Asian elephant, and they co-existed with pawpaws (an exceptionally nutritious food source) for millions of years. Despite the results of this experiment, I believe mastodons ate pawpaws. Genetic studies suggest pawpaws still have high genetic diversity because not enough time has passed since the extinction of their megafaunal dispersers. Native Americans cultivated orchards of pawpaws, and Iroquois Indians may have spread the fruit to its northernmost range limits. Pawpaw fruit. I grew saplings from these seeds. The fruit is very sweet, has the texture of a cooked sweet potato, and exudes a tropical aroma. Pawpaws are not well known today because they are difficult to market and cultivate. The fruit has a shelf life of 2 weeks, so it can’t be warehoused, though it can be frozen. Experimental breeding may eventually prolong the shelf life, however. Wild strawberries have a shelf life of 1 day, but cultivated strawberries have been bred to last at least a week. Pawpaws grow slowly and have low pollination rates and thus low fruit production. Bees don’t pollinate pawpaw flowers. Instead, the red flesh color of the fruit attracts scavenging beetles, fruit flies, and blow flies. Flies and beetles are less efficient pollinators than bees. The center of modern day pawpaw cultivation is in Kentucky. Many new varieties are being developed and perhaps soon, they will be found in grocery stores or farmer’s markets. All but 2 of the 60 varieties grown during the early 19th century have been completely lost as the fruit became forgotten by urban and suburban spawn of the rural folks who grew them. A nice lady from Indiana sent me some pawpaw fruit almost 6 years ago. I was able to germinate 5 saplings from 30 seeds. The saplings are growing slowly and the top trunk of 2 of them broke off last fall. I’m not sure why this happened. I don’t see zebra swallowtails in my neighborhood, but some insect, perhaps another species of swallowtail larva, has been eating the leaves. I doubt I’ll ever get fruit from these trees. The best of my 5 year old pawpaw trees. I’m not going to transplant it. Thick roots are already growing through holes in the bottom of the pot. Compare the above 5 year old pawpaw sapling with this 4 year old peach tree that I also planted from seed in my yard. The peach tree is 12 feet tall and loaded with fruit. Click to enlarge. The pecan tree is 1 of 17 species of hickory trees. Hickories are native to North America and Asia and formerly occurred in Europe, but Ice Ages, beginning about 2.5 million years ago, wiped them out there. European mountains have an east to west orientation, while American mountains are oriented north to south. Hickories prefer temperate climates, and the east-west mountains blocked their retreat in Europe during glacial expansions. This explains why hickories and so many other tree species survived Ice Ages in North America but not in Europe. Evidence of fossil pollen grains suggests hickory trees grew alongside dinosaurs during the late Cretaceous, though the oldest fossil hickory nut dates to about 34 million years ago. Most early hickory species had thin shells, but they evolved thicker shells about 38 million years ago in response to the evolution of tree squirrels. Squirrels love the nutrient rich nuts, so hickories evolved nuts with thicker shells, and the squirrels in turn evolved greater gnawing power. Evolution is a constant struggle. However, pecans retained the thinner shells of their early ancestors. This puzzled me because it seems as if squirrels would have eliminated all hickory species with thinner shells because they were easier to exploit. I wondered if pecans were a recent species, cultivated and spread by Native Americans. I’ve concluded however, based on certain lines of evidence, that pecans are an ancient species of hickory, not a recently evolved species manipulated by man. 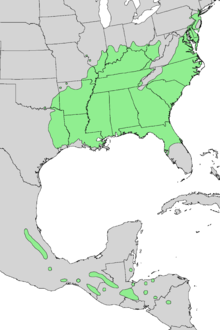 Native range of wild pecan trees. Man has greatly expanded this range by planting pecan orchards. Georgia is now the leading producer of pecans, though they are not native to this state. Pecans need longer growing seasons than other species of hickory because their nuts mature later. Genetic studies determined pecans have a large genetic diversity within populations. If pecans descended from human cultivation, they would have low genetic diversity because they would descend from a small population initially cultivated by man. I was also mistaken in considering squirrels the only major predator of hickory nuts. The pecan weevil ( Curculio caryae ) infests all species of hickories, and pecan trees growing in mixed stands with other hickory species have an advantage over their cousins. Pecans mature later in the season than other species of hickory. The pecan weevil hatches and emerges in August and will infest whichever hickories have developed kernels. Because thick shelled hickories mature before thin-shelled pecans, the pecan weevil will infest them first and go through their life cycle without ever infesting the thin-shelled pecan. Weevils will wait for pecans to mature, if no other hickory trees are available. So though thin shelled pecans may suffer heavier squirrel predation, they are less likely to have their nuts destroyed by weevils, if they grow near other species of hickory. Pecan weevil larva. Pecans mature later than hickories. Though squirrels favor pecans over hickories, the later maturing pecans are less likely to be attacked by pecan weevils in mixed forests, giving pecans an advantage over other hickory species. Pecans are native to river bottomland terraces where they grow in forests dominated by sycamore, sweetgum, and elm. Other subdominants in these terrace forests include water oak, box elder, silver maple, cottonwood, green ash, hackberry, and other hickory trees. Pawpaw, bamboo cane, pokeweed, grape vine, poison ivy, and green brier make up the thick undergrowth of bottomland forests. Pecans hybridize with 5 other species of hickory. The nuts produced by wild pecans and hybrids vary in quality. Most are smaller and have somewhat thicker shells than cultivated varieties of pecans, and some even have high amounts of bitter tannins–all part of their ongoing evolutionary war with squirrels and weevils. Human cultivation of pecans on a large scale began circa 1900. Though Georgia isn’t part of the pecan’s native range, the state is the leading producer, and there is a large demand in China and India, resulting in high prices at the grocery store for the nuts. Most cultivated varieties of pecans don’t mature before the first killing frost occurs in Midwestern states. A few small early maturing varieties can produce in the Midwest as can the hican–an hybrid cross between pecan and shellbark hickory. 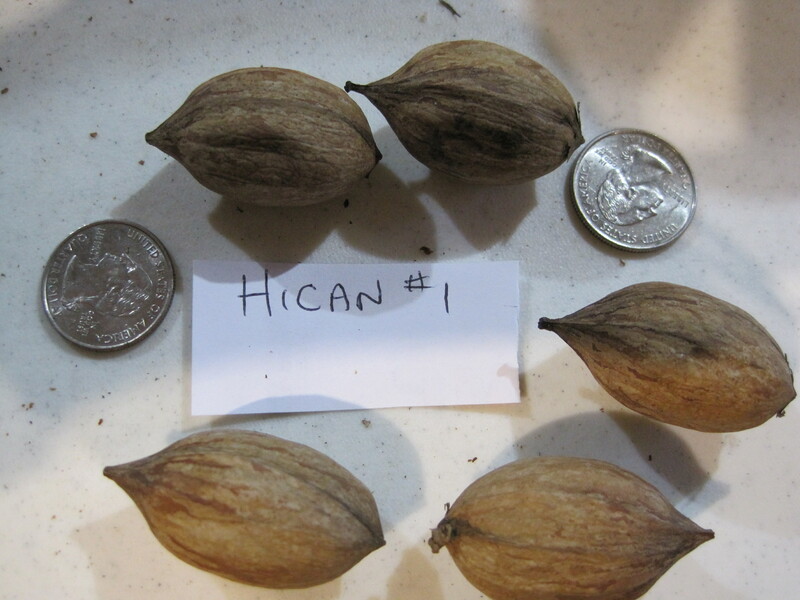 Hican nuts–an hybrid cross between a pecan and a hickory. They produce earlier maturing nuts for northern locations that have frosts before pecans can fully develop. The southern Mississippi River Valley has long served as a refuge for pecans and other hickory trees during glacial expansion cycles. Here, they grew in mixed Ice Age forests with spruce, beech, walnut, and oak. Pecans expanded their range north up the Mississippi River Valley following the end of the last Ice Age. The oldest written recipe for pecan pie dates to 1886. It was a custard pie made with sugar, eggs, and butter. (Sugar/custard pies originated during the Middle Ages.) Pecan pies became more popular in the 1930s when some unnamed employee of Karo syrup invented a recipe for a pecan pie using syrup as well as sugar. I prefer my pecan pie made with maple-flavored corn syrup. Pecan pie with whiskey maple cream sauce. I like my pecan pies made with maple flavored corn syrup. Alarmist reports from the sensationalist media, suggesting an eventual end to the availability of fruits and vegetables because of colony collapse disorder, are completely unfounded. (See: https://markgelbart.wordpress.com/2015/06/12/pleistocene-pollinators ) In North America the honeybee (Apis mellifera) is a non-native invasive species. The decline of this species due to this mysterious disorder may cause high honey prices, but it will not impact the pollination of most agricultural crops. Honeybees are just 1 of thousands of pollinating insect species. A recent study of bees in north Georgia apple orchards found that honeybees comprised just 7% of the total number of bees captured. Moreover, native bees are much more efficient pollinators than honeybees. Researchers surveyed bees in 4 orchards in north Georgia: Mercier Orchard with 150,000 trees planted on 200 acres, Hillside Orchard with 40,000 trees, Tiger Mountain Orchard with over 1000 trees, and Mountain View Orchard with just under 1000 trees. The scientists captured a total of 2025 bees consisting of 128 species and 30 genera. The most common species of bee caught in their traps was the hawthorn adrena (Adrena crataegi). It comprised 31% of the bees in the survey. It’s named after the hawthorn bush, a common species inhabiting open woods that produces a small apple-like fruit. This species of bee readily adapted to pollinating apple blossoms after Europeans introduced the fruit to America. Hawthorns are in the same family as apples. 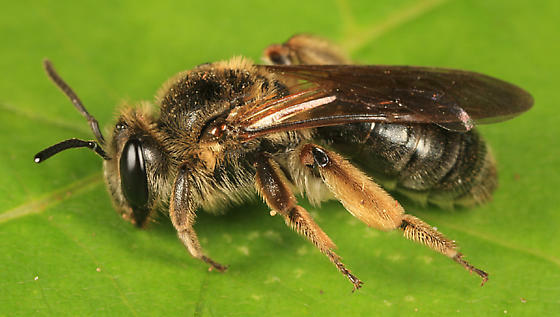 The 2nd and 3rd most common bees caught in the traps were the wasp-like bees–Lasioglossum (dialectus) imitatum and L. (d.) pilosum. Bee families in order of abundance were the Andrenidae (mining bees) composing 46.5%, the Halictidae (sweat bees) composing 34.2%, the Apidae (honeybees and bumblebees) composing 17.1%, the Megachilidae (mason and leafcutter bees) composing 1.8%, and Collectidae (polyester bees) composing .4%. Incidentally, the authors of this study, even with outside help, couldn’t identify 10% of the species they trapped. There are still many species of insects in North America yet to be described and named by entomologists. All these species of bees pollinate a wide range of native and non-native plants. Most of the species of bees in the Andrenidae family are solitary, but the hawthorn adrena does nest communally. The authors of this study suggest the hawthorn adrena as a replacement for honeybees in areas where the latter have suffered severe population declines. Adrena crataegi is by far the most abundant species of bee that pollinates apples in North Georgia. It’s native to North America and could be used to replace honeybees used for pollinating fruit. 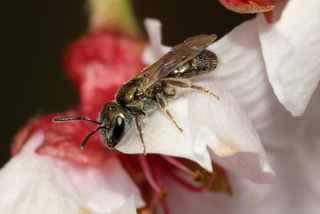 The wasp-like bee (Lasioglossum imitatum) is the 2nd most common pollinating bee in north Georgia apple orchards. European settlers planted apple trees in North America as soon as they arrived on the continent. Apples were most important for the production of hard cider, a substitute for beer in regions where barley crops were unreliable. Alcoholic beverages were considered an essential part of daily living during the colonial era. Some rich planters imported young trees bearing the highest quality fruit known in Europe, but most settlers started their orchards from seeds they obtained at little expense. Apple trees grown from seeds don’t produce the same quality fruit as their parent. Most fruit from seedling apple trees is of poor quality. Twigs from the rare tree that does produce good fruit are grafted on root stocks of other apple trees. That is how good varieties of apples are cultivated. Settlers moved inland and planted large orchards from apple seeds. The majority of these trees produced fruit that was used to fatten hogs but served no other purpose. A few trees produced fruit that was good enough to feed members of the household. A few mature apple trees would provide plenty of fruit, even for the large farm families of the time. Other apple trees produced fruit with certain qualities particularly suited for certain purposes. Some trees produced apples that more readily fermented into cider and vinegar. Some of the best cider apples were considered unpalatable fresh off the tree but made a superior drink when fermented. Other trees bore apples that were only of fair eating but kept without refrigeration until late spring. Still others bore palatable fruit as early as June. A farm with a long-keeping variety and an early bearer could have a year round supply of apples. Most apples ripen from August-October, but the red June apple is prized for ripening earlier. 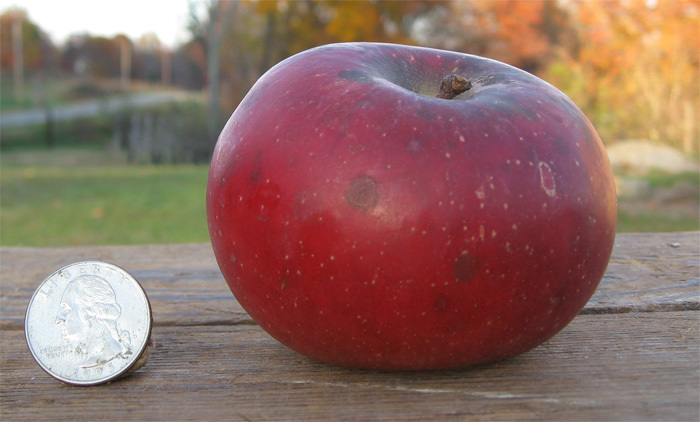 The horse apple was one of the most popular apples in the south before 1930. Not great for fresh-eating, the vigorous trees reportedly produce large crops of apples that are good for cider, drying, and jelly. George Washington and Thomas Jefferson grew Hewe’s crabapple for cider. Johnson Keeper apples originated in Mississippi some time before 1885. They keep until late spring without refrigeration. 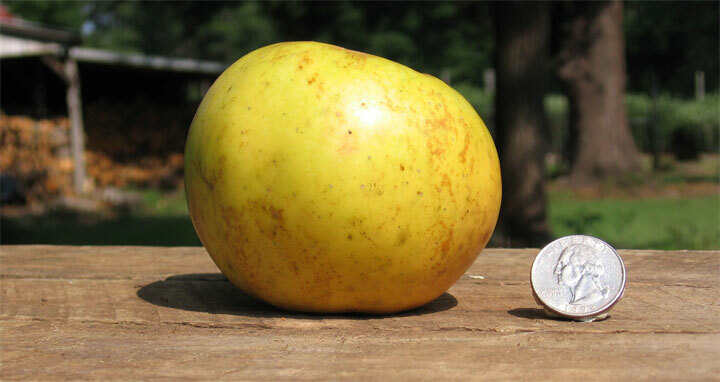 The Mattamuskeet apple is a very rare apple originating near Lake Mattamuskeet, North Carolina. It’s known for its long-keeping quality. Some claimed this apple could keep for years without refrigeration. This variety has an interesting origin story that may or may not be true. Supposedly, an Indian found the seed of this apple in the gizzard of a goose he shot along the shores of Lake Mattamuskeet. He planted this seed and gave the twigs (scions) to European settlers. 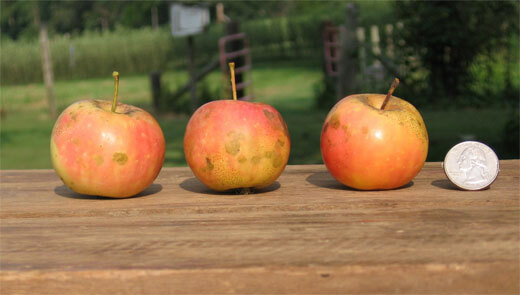 Some of these antique apple varieties were better suited for drying and could be kept indefinitely. Varieties that disintegrated in stews to add a tart sweet flavor increased the repertoire of country cooks. Using apples to season pioneer stews of wild game precedes the common use now of tomatoes in stew. Over 1800 varieties of apples were grown in southern orchards between 1600-1930. The most successful varieties were well adapted to the southern climate with its long humid summers and mild winters. Apples require a certain amount of cold weather or they won’t bear well. Many varieties grown in the south had a low chilling requirement. They were also resistant to local diseases. Many of these old-timey varieties became rare or even extinct when family farmers left the land to take factory jobs during the middle of the 20th century. Fewer than 20 varieties of apples are sold in grocery stores today. These very sweet, all purpose apples probably do taste better than most of the antique varieties but lack the characteristics that made the older types better for certain purposes such as the making of apple butter, jelly, or cider. In recent years 2 major brands of hard cider have begun to appear on the beer aisle in grocery stores. They both taste like yeasty bad home brew. The makers of these brands might want to experiment with some of the older varieties of cider apples, so they can improve their product. A new study suggests wild squash and megafauna had a long mutually beneficial relationship during the Pleistocene. Wild squash evolved bitter poisons known as cucurbitains in their flesh that discouraged seed consumption by rodents. However, large mammals have fewer bitter taste receptors and can consume large quantities of cucurbitains without ill effect. Most squash seeds could survive passage through the gut tract of a megaherbivore and were spread throughout the environment in fertile piles of dung. The squash plants thrived in open sunny environments created by megafauna foraging and trampling. Mammoths, mastodons, and giant ground sloths killed trees by uprooting them or by stripping off the bark. This opened woodland canopies where squash plants were exposed to direct sunlight. Trampling and wallowing also killed grass, resulting in bare soil environments where squash plants could germinate with less competition. In exchange for providing food, wild squash enjoyed a wide and continuous geographic distribution during the Pleistocene along megafauna game trails, around water sources, or wherever megaherbivores congregated. Wild squash seeds extracted from ancient mastodon dung. After the megafauna became extinct the range of wild squash was fragmented into relic habitats. Some species likely became extinct. Seeds found in fossil mastodon dung in Florida don’t exactly match those of any known species. However, humans began cultivating squash about the same time the megafauna died out (circa 10,000 BP). Initially, humans used the squash rinds as containers, but the seeds could be eaten as well, if the toxic pulp was washed off the edible kernels. Humans selected for mutated squash that had sweet rather than bitter flesh. Successful cultivation of improved varieties didn’t occur until wild squash became less common in the natural environment because when improved varieties backcross with wild varieties, a bitter hybrid is produced. This suggests good varieties of squash were not cultivated until Pleistocene megaherbivores were completely gone or rare. Without mastodons wild squash lost their distributors, and cultivated squash could grow with less chance of backcrossing. The scientists who conducted this study looked at the genomes of 91 squash specimens consisting of 12 species and including 42 domesticated specimens, 30 wild specimens, and 19 specimens found at ancient archaeological sites. They determined squash was domesticated independently in several different regions in Mexico and southeastern North America. The genetic evidence suggests the Okeechobee gourd (C. okeechobeensis), today restricted to 2 regions of Florida, is essentially the same species a C. lundelliana, a wild squash found in Mexico. The Okeechobee gourd likely had a more continuous distribution during the Pleistocene. They also looked at the genomes of 46 species of mammals to analyze the bitter taste receptors of each. Smaller mammals and humans have many more bitter taste receptors than elephants or rhinos. Smaller mammals are more vulnerable to toxins and need to avoid them. Large mammals have greater tolerance to toxins because of their physiology and size. Thanksgiving wouldn’t be complete without sweet potatoes and mashed Irish potatoes (Solanum tuberosum). Both species originated in Central and South America, and paleo-indians were the first humans to eat them, possibly as early as 13,000 years ago. Genetic and morphological studies suggest the sweet potato originated in the region located between the Yucatan Peninsula, Mexico and Venezuela. The ancestor of the sweet potato is not known in the wild and may be extinct. The modern sweet potato is likely a hybrid cross between this extinct wild ancestor and a species of morning glory (Ipomoea triloba). Foraging humans may have gathered the sweet potato’s wild ancestor to extinction. 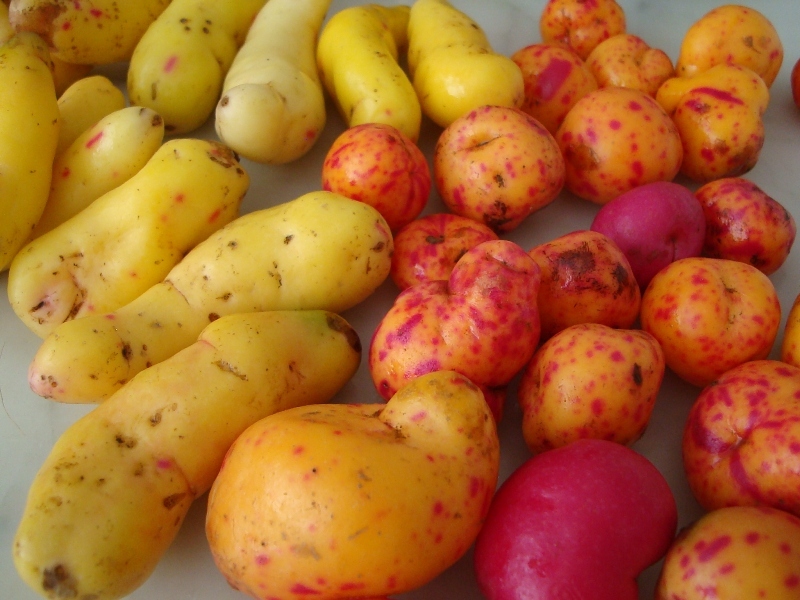 The oldest archaeological remnants of sweet potatoes were found in a Chilca Canyon cave. Chilca Canyon is located near the south central Pacific coast of Peru, and it was much farther inland 10,000 years ago when paleo-indians left remains of their food here. (At least 1 archaeologist disputes the age of this evidence.) This region was a coastal savannah with some wooded areas then. Remains of other species found in this cave in addition to sweet potato include Irish potato, olluca (Ullucus tuberosa), jicama (Pachyrhizos crosus), bottle gourd, and prickly pear. Archeologists believe paleo-indians initially spread sweet potatoes and other edible plant species by accident. All of the above mentioned plants will readily sprout from their tubers, roots, or seeds, if carelessly tossed in a garbage pile in contact with soil. By observing these accidents, paleo-indians learned to deliberately plant and care for these valuable plants when climatic conditions deteriorated and food became scarce. Climate did become more arid along the Peruvian coast during the Holocene. Native Americans settled near oasises located in a landscape that had transformed from savannah to desert. Several archaeological sites in the Pampas de las Llamas region show that by 3500 BP native Americans were cultivating sweet potatoes, Irish potatoes, common bean, lima bean, oca (Oxalis tuberosa), oculla, peanuts, peppers, turban squash, avocado, edible canna (Canna edulis), cotton, bottle gourd, eggfruit (Pouteria lucuma), peanut butter fruit (Buchosia armeniaca), and manioc root. The remains of wild game, marine mammals, and fish were also found at these sites. Manioc root is poisonous, if not processed in a certain way. When paleo-indians first colonized South America, they were unfamiliar with the many plants that grow in tropical climates. The popular image of paleo-indians as meat-eaters is partially true, but an healthy human diet includes carbohydrates. Surely, paleo-indians were aware that many plants were poisonous, yet the craving for carbohydrates drove them to take chances with unfamiliar roots, tubers, and fruits. This trial and error likely led to many deaths or at the very least bad stomach aches. But poisonous compounds are usually bitter. This important clue helped guide the selection and processing of the unfamiliar plants. Early people learned that some poisonous plants could be made edible by leaching the poisons in boiling water or by some other processing method. They must have been really hungry for carbohydrates to make that much effort. Paleo-indians got lucky when they discovered the wild ancestor of the sweet potato. There is a species of morning glory (I. pondurata) with an edible root that ranges in southeastern North America. Reportedly, cooks can rid the bitterness by boiling the root in several changes of water. It’s likely the first sweet potatoes (a species of morning glory) had to be processed in the same way. Paleo-Indians were rewarded with an extremely nutritious food. Sweet potatoes are high in protein, carbohydrate, magnesium, potassium, sodium, phosphorus, vitamin C, B vitamins, and beta-carotene which the human body converts to vitamin A. Thousands of years of deliberate cultivation has led to many delicious varieties of sweet potatoes that need no processing other than baking. There are orange, yellow, white, and purple sweet potatoes. Different varieties of sweet potatoes. Scientists think the sweet potato is the result of a cross between this species of morning glory and another unknown ancestral species in the ipomoea genus. Humans crossed them either accidentally or deliberately. Ipomoea pandurata is a morning glory with an edible root that is native to southeastern North America. The roots reportedly need quite a bit of processing to make them palatable. The seeds of I. violacca are used as an hallucinogen similar to LSD. I like candied sweet potatoes with or without marshmallows, but I think the best way to prepare them is by simply baking them, then serving with plenty of butter and cinnamon sugar. I use baked sweet potato flesh in pies I make with condensed sweetened milk, brown sugar, eggs, ginger, and nutmeg. White sweet potatoes are drier but sweeter than orange sweet potatoes. Yellow sweet potatoes were the most popular variety in the U.S. during the 1930’s but have since fallen from favor and are hard to find, yet they taste as good as the orange ones. Sweet potatoes grown in Louisiana and Mississippi are marketed as “yams” but they are not true yams–a root rarely found in the supermarket. True yams are not closely related to sweet potatoes but belong to the dioscorea genus. Canna flaccida. The roots of the canna lily have also been eaten in Peru for thousands of years, probably since the Pleistocene. The remains of olluco (Ullucus tuberosus), another edible species found in the Chilca Canyon caverns, date to possibly 10,000 BP. You are currently browsing the archives for the botany category.